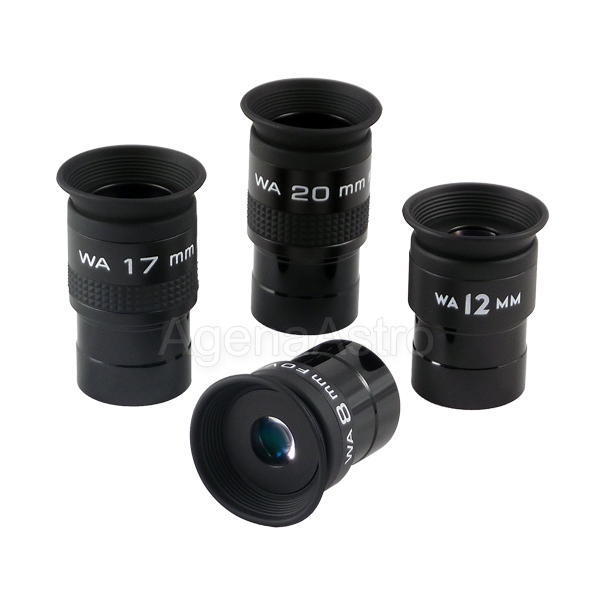 Here's a very good starter eyepiece set that won't break the bank! With a 1.25" barrel and four focal lengths (8mm, 12mm, 17mm, and 20mm), these compact and lightweight eyepiece gives bright, crisp, and wide-angle views of the Moon, planets, and deep-sky sights with any telescope. High-index glass with broadband multi-coatings enable a wide 60 to 65 degree apparent field of view with excellent color correction and minimal image distortion. Blackened lens edges and anti-reflection threads ensure maximum image contrast. Viewing position can be adjusted with fold-down rubber eyecups. The upper barrel is made from black anodized aluminum, and the base of the barrel is threaded for standard 1.25" filters. To minimize the need for refocusing, these eyepieces are parfocal with other eyepieces in the same series.